Nonjatta: Ichiro's Malt 15 years - "Tom Cruise not Alec Guinness"
Ichiro's Malt 15 years - "Tom Cruise not Alec Guinness"
I have struggled with this one: quite a buttoned up sort of a drink and not easy to characterize. 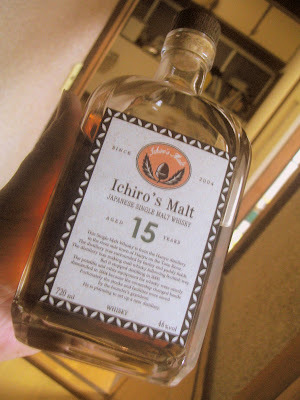 It is not my favourite Ichiro`s Malt, not enough character for that, but there is nothing particularly wrong with it either. I wouldn`t even say it was boring, just not really striking in any particular way. Tom Cruise not Alec Guinness. It had a fairly strong nose: a cross between sweet, cheap fizzy cider and the plastic smell of a freshly unpacked blow-up doll. The first taste was quite drying. Spicy. Cloves? There was also a wood flavour, like sucking on an ice lolly stick. It was balanced and classy enough but, as I say, quite a buttoned up, stiff upper lip sort of chap. Funnily enough, I found this one benefited more from a touch of water than the Ichiro's Malt Three of Diamonds or the Single Cask 2000, both of which are more powerfully alcoholic. Diluted, it was a bit more mellow and rounded.